San Francisco is our home, so residents and visitors here never know when and where we might set-up Dialogue. 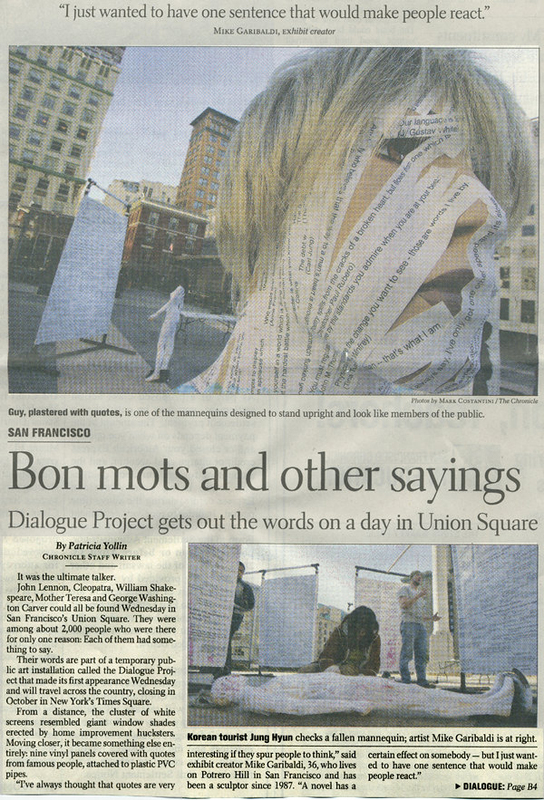 We featured our Holiday version of Dialogue in Union Square on November 27th & December 6th, 13th and the 24th (Christmas Eve!). Check out our Holiday Quotations and photos from the Holiday Union Square installations! You can also browse quotations that viewers submitted to us during our Holiday installation in San Francisco on the "Quotes by Subject" pages. 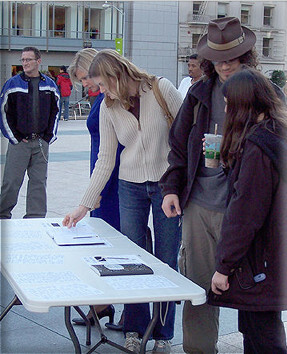 Viewers who happened upon Dialogue in the center of busy Union Square gave it a warm and grateful welcoming. After talking with people and hearing their responses, we are even more excited than ever to take Dialogue on the road and have as many people interact with it as possible. Dialogue actually exceeded our expectations by sparking all sorts of conversations, inspirations and connections. We overheard one women talking with her hospitalized sister on the phone. She was reading humorous quotes off the "body" and "fun" Dialogue panels to help cheer her up. It was wonderful hearing them laugh together on the cell phone and to have Dialogue spark that healing laughter. A conservative business man was standing next to a liberal couple while reading quotations on the "life" panel. 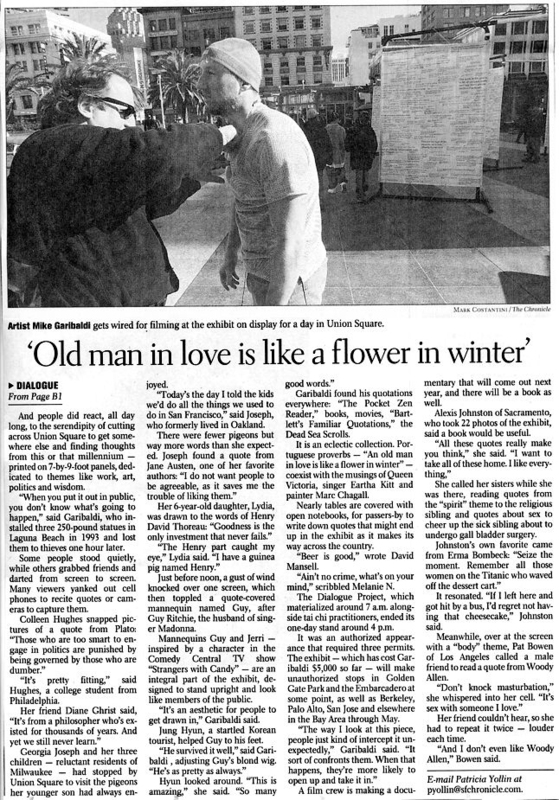 One particular quote seemed to really resonate with the couple so they turned to the man and said, "now doesn't that make your day?" He responded back and they began talking about life and politics together. I was approached by one young artist who said she had been trying to overcome a mental block in her studio. For some reason she just could not seem to get back into her painting. After browsing through Dialogue for about an hour, however, she became inspired and was heading back to her studio to work on some revelations she had. Here are photos taken during the Union Square installation. To view more photos simply click on the "next page of photos" link. There are around 35 photos total.